The Phantom comic book, like all forms of genre-bound entertainment, adheres to a formula which blends novelty and familiarity in near-equal measure. 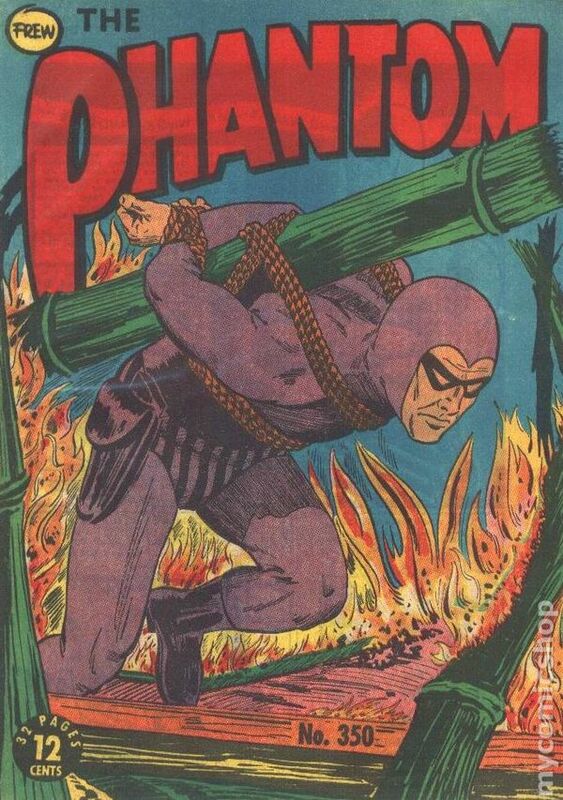 We know that, in most instances, when we open an issue of The Phantom, there is a good chance the story will be set in the jungles of Bangalla; that “The Ghost Who Walks” will be confronted by a new threat to himself, his family, or to the jungle domain he is duty-bound to protect; and that, after surmounting overwhelming odds or dangerous obstacles, The Phantom will use his quick wits, finely-honed instincts and sheer physical strength to overcome evildoers (whose jaws will, at some point, come into contact with the Skull Ring worn on his right fist). 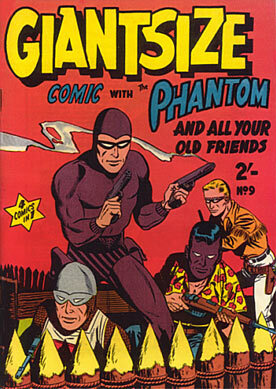 In the Australian context, part of the enduring appeal of The Phantom comic magazine (produced continually by Frew Publications since September 1948) must be attributed to its regularity (each new issue goes on sale every fortnight with clockwork regularity), its ubiquity (there would be very few newsagents or newsstands in Australia which didn’t stock this comic), and – at least until the mid-1980s – its visual familiarity. Since the early 1950s, Frew Publications seldom departed from its tried & tested cover design formula, wherein the reddish-orange “Phantom” logo would be plastered across the uniform blue backdrop, punctuated by the barest hint of background detail – the hint of jungle foliage, the deck of a boat, or a glimpse of a brick wall. 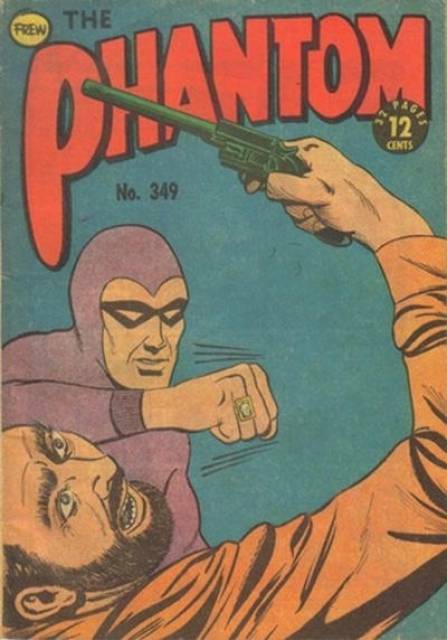 The purple-costumed Phantom stood out in stark relief against this purposefully bland background, which was no doubt a useful sales technique which ensured that The Phantom got noticed amidst the once-crowded comic book sections of retail newsagency outlets and on newsstand racks. The cover on the left, rendered in vibrant colour, was painted by acclaimed American illustrator, George Wilson. 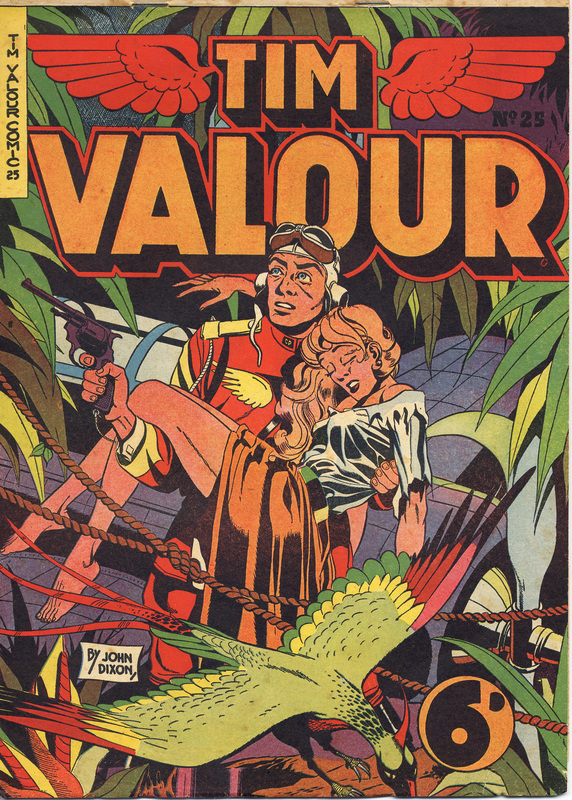 The cover on the right clearly borrowed the foreground figures from the Gold Key edition, but Frew’s (anonymous) cover artist dispensed with the dramatic background created by Wilson, in favour of the featureless blue backdrop. 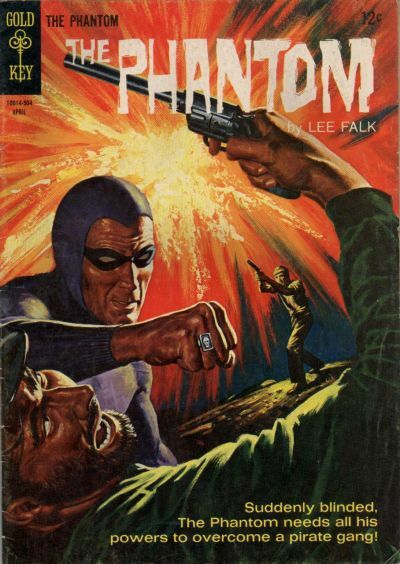 Frew Publications was still using paper covers on The Phantom, which could not adequately reproduce the rich, four-colour artwork seen on the glossy-covered Gold Key comic. This was entirely in keeping with Frew’s frugal production values, which relied on a limited palette of bold, flat covers – such as purple, green and orange – which could be printed on flimsy paper covers. Frew Publications would, on occasion, attempt to reproduce the full-colour American cover designs more faithfully, while omitting some visual elements which bore no relation to the contents of a specific issue of The Phantom, as seen in these two covers. Once again, the cover on the left (The Phantom, No 7, Gold Key/Western Publishing, 1964) is painted by George Wilson. 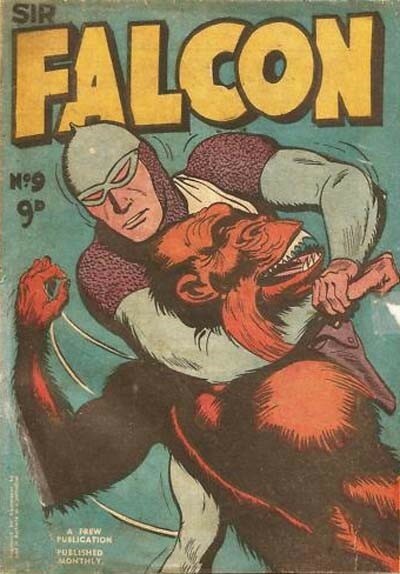 Frew Publications’ (again, uncredited) cover artist has redrawn Wilson’s design as a black-line illustration, but has removed the background figures of the “super apes” appearing in the American story. The issue shown here (No.350, 1967) actually contained two entirely different Phantom stories: “The Marshall Sisters” (Part 1) and “Adventure in Algiers” (Part 1). Why did Frew Publications freely adapt elements of these Gold Key cover designs, without reproducing any of the interior stories for their Australian readers? Oddly enough, Frew Publications did reprint two Gold Key stories – “The Rattle” and “The Test” (originally published in The Phantom, No.2 , and each drawn by Bill Lignante) – in The Phantom (No.236), back in 1963. 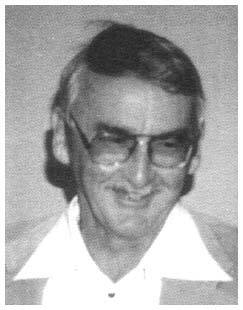 I suspect it was because the Gold Key stories – which typically ran between 12-15 pages each – were not sufficiently long enough to flesh out Frew’s 32-page editions (which carried little or no advertising), and thus required more pages of artwork per issue. Cost may have also been a factor – did the licensing fees for using these newer American stories, prepared specifically for comic magazines, greatly exceed the licensing fees incurred to reproduce older newspaper strip episodes of The Phantom? Whatever the reason, these austere adaptations of American cover designs did, in their own way, reflect Frew Publications’ modest efforts to update and modernise the outward appearance of The Phantom comic book. It could be argued that this process began when Frew first published the work of American artist, Sy Barry, who bought a more dramatic and realistic style to The Phantom newspaper comic strip in 1961 (Barry’s first daily newspaper Phantom story, “The Slave Market of Mucar”, was reprinted by Frew Publications in The Phantom, Nos.212-213 ). 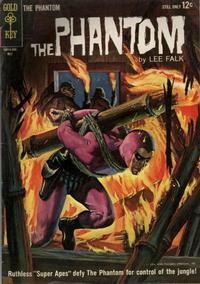 This continued to be the case throughout the 1960s and early 1970s, as Frew Publications took greater efforts to produce more “modern” cover designs that mirrored Barry’s dynamic, muscular interpretation of The Phantom (Frew would often use Barry’s artwork as the basis for their cover designs). 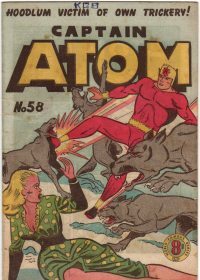 The way it did so was a reflection of the enforced economies of Australia’s comic-book publishing industry, which by this time was struggling to compete with television, radio and popular music for the attention of the youth audience that increasingly spurned comics in favour of more exciting forms of electronic entertainment (mages courtesy of Comic Vine, the Grand Comics Database and MyComicShop.com). That’s the question posed in an article by Naomi Kopp at Vibewire.org. Both myself and fellow PhD candidate, Amy Maynard (University of Adelaide), were interviewed for this story to provide insights about the historical development of Australia’s comic-book industry, and the current “state of play” for Australian comics, graphic novels, their creators and their audiences. 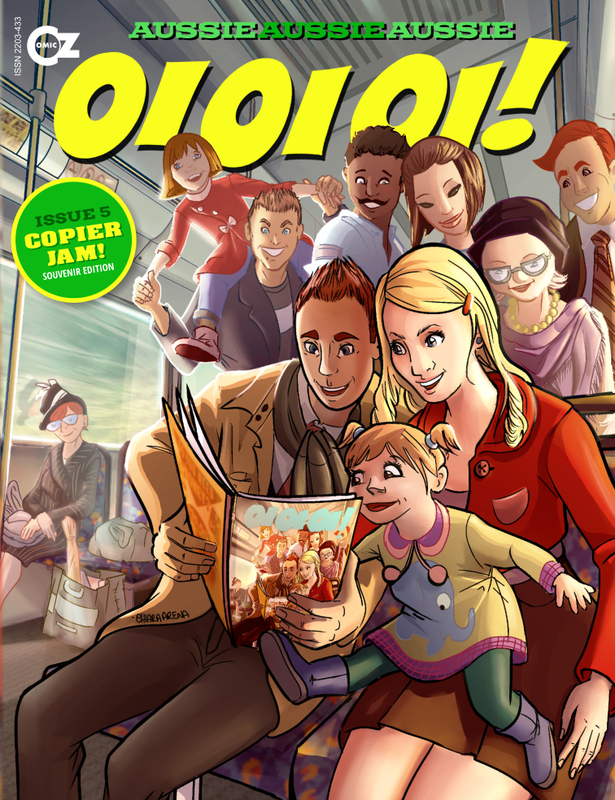 Amy is examining how hard-copy (printed) comic books are currently produced in Australia, and her thesis will consider current publishing processes, funding models, marketing and distribution issues. As part of her thesis, Amy is also surveying Australian readers about their comics/graphic novel reading preferences, and their attitudes towards Australian comics.You can complete her survey – which is totally private and anonymous – here. The title of the Vibewire article nonetheless poses an intriguing rhetorical question, especially when it comes to The Phantom. 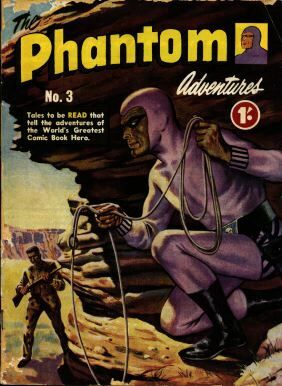 Several respondents to The Phantom Comic-Book Survey remarked that they considered “The Ghost Who Walks” to be a “domestic” comic-book hero, who in some ways reflected either their own country’s sense of national identity or character, regardless of whether they were Swedish, Indian or Australian. 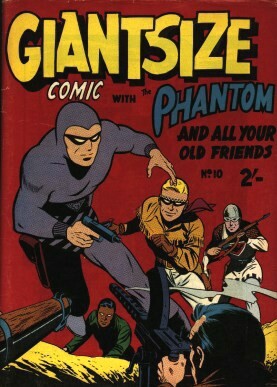 The perception that The Phantom was somehow an indigenous comic book was also influenced by the magazine’s physical format, distribution and overall appearance – the fact that these international editions of The Phantom did not superficially resemble imported American comics reinforced the idea that it was, indeed, a “local” comic-book.